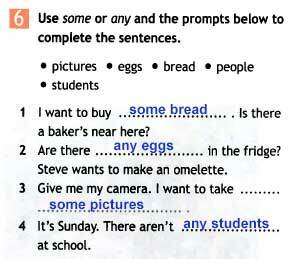 I want to buy some bread. Is there a baker’s near here? Are there any eggs. In the fridge? Steve wants to make an omelette. Give me my camera. I want to take some pictures. It’s Sunday. There aren’t any students at school. Fiona has a Spanish Class on Monday. 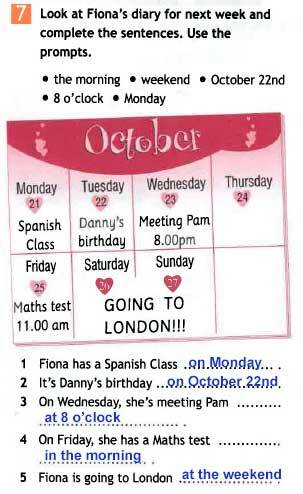 It’s Danny’s birthday on October 22nd. On Wednesday, she’s meeting Pam at 8 o’clock. On Friday, she has a Maths test in the morning. Fiona is going to London at the weekend. Когда у тебя день рождения? — 4 июня. А у тебя? — Тоже летом. — When is your birthday? — On the 4th of June. And yours? — It is in summer too. Дорогой друг! Приглашаю тебя на день рождения в субботу 3 апреля в 16.00. Мой адрес: ул. Садовая, д.17, кв. 35. Это будет день рождения по-английски! — Dear friend! I invite you to my birthday party on Saturday the 3rd of April at 16.00. My address is flat 35, 17, Sadovaya St. It is going to be an English birthday party. В нашем микрорайоне есть замечательный парк. Он находится рядом с нашей школой. В парке много огромных старых деревьев и красивых цветов. Посреди парка — фонтан. В северной части парка — моё любимое кафе. Мне очень нравится там фруктовое мороженое. — There is a wonderful park in our neighbourhood. It is near our school. There are a lot of big old trees and beautiful flowers in the park. There is a fountain in the middle of the park. In the northern part (in the north of) of the park there is my favourite café. I like fruit ice cream there very much. Это ваша новая квартира? — Да. — Сколько в ней комнат? — Четыре. — Какая комната твоя любимая? — Библиотека. У нас очень много книг по истории. В углу -мое любимое старое зелёное кресло. — Is it your new flat? — Yes. — How many rooms are there in it? — Four. — Which room is your favourite? — The library. We’ve got a lot of history books/books on history. In the corner there is my favourite old green armchair. Извините, который час? — Без четверти два. — Excuse me, what’s the time? — A quarter to two. Осторожно, мама! — Всё в порядке, дорогой! — Watch out, mum! — It’s OK, dear. О боже! — Что случилось? — Oh, dear! — What’s up? Здравствуйте! Могу я поговорить с Максом? — Я слушаю. — Hello! Can I speak to Max? — Speaking.